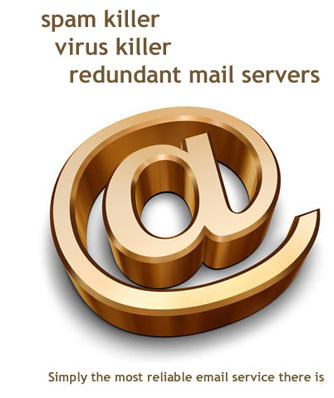 If the reliability and dependability of all your emails is important to you AND your business, get Sure Mail™, the only e-mail service that is Spam Free, Virus Free and features full email redundancy at all times. SureMail™ was created specifically for people that depend on the highest reliability of all their emails, WITHOUT any spam or viruses. Free email-based services such as Hotmail, Gmail or Yahoo Mail are good, but they aren't 100 percent dependable. Free dosen't always mean your email will get in your inbox. Sure Mail™ solves all that with fully redundant email servers and fast OC-192 Internet connections. First, there's no software to download or install on your computer or workstation, since our email service completely runs on our dependable email servers. When somebody sends you an email, it first goes to one of our data centers, where it is carefully analyzed for any potential signs of spam or viruses. If all checks OK, within seconds, your email is sent to your InBox for your immediate retrieval. It's as simple as that! Get the most efficient email messaging service there is today. Get SureMail (tm). NEW! Read about our Email Bank (tm) message archiving, search and retrieval service that will soon be available to businesses of all sizes. If your business relies on message achiving and search, look no further.